Blogging for a small business is different. It just is. Most of the list of blog topic and blog prompts out there won’t apply to what you’re doing or what you need to do. 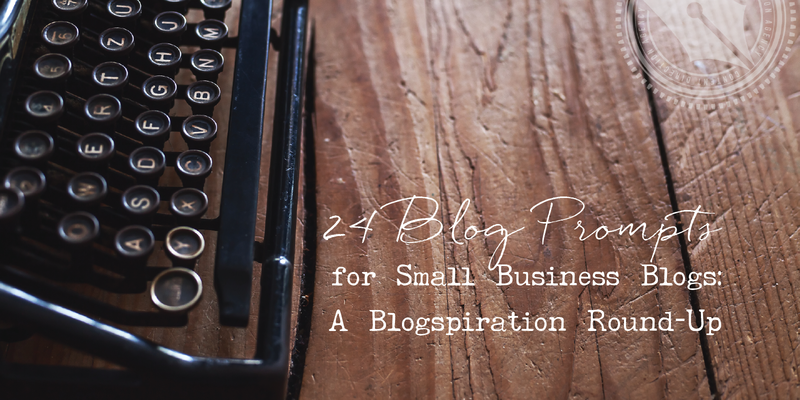 So I decided to do a round up of my favorite blog prompts for small business blogs. With this list, you need never be at a loss for what to blog about again! Before we get into the blog prompts for small business blogs, let’s make sure we’ve got the basics right, first. It may seem like a silly question, but this is one of the basics I often see small business owners get wrong. And it’s easy to do — I made the exact same mistake when I started this business. You’re writing to the wrong audience. For me, I started writing to DIY biz bloggers instead of the people who would hire me to blog for them. You might be writing to your peers instead of your customers, or you might be writing to beginners when you really want to attract more advanced people. Check out this post for resources for creating an ideal reader profile and remember: your ideal reader might be slightly different from your ideal customer, but not that different! Many small businesses — especially product-based businesses — have a hard time figuring out what to talk about. They know they shouldn’t be talking exclusively about their product or service, but what else is there to say? If you’re looking for blog prompts because you’re not sure what you should really be blogging about, check out my Think Sideways exercise. The key to blogging successfully for your small biz if you’re not doing “how to” type posts is to think about what else your customer is interested in, and blog about that. WHY are you blogging for your business, anyway? This is a biggie! If you don’t really understand what you hope to get out of blogging, you won’t get much of anything out of it. And I certainly don’t want you to waste your time. So spend just a little while considering your big why for blogging and then how you’re going to achieve and measure that. This post is a good place to start. Be sure to choose metrics that are meaningful to your business. For most people, a comment or Facebook like isn’t really moving their business forward, but an email opt-in is. Want more blog prompts for your small business? I’ve got a free spreadsheet with 201 blog prompts for small business blogs that you can start writing today. If you blog once a week, that’s almost four years worth of blog topics, and I’m giving them away for free. Just click here to upgrade your access and get the spreadsheet by email immediately. Write a manifesto. This is a great place to start if you have a brand new blog and don’t know what to blog about. Write it as though you’re writing a letter to a friend and telling them why you started your business. Solve a level-1 problem. Your business solves a problem. But for many businesses, there are other problems the customer must overcome before they’re even ready to buy. If you can help them solve one of these earlier problems, they will like and trust you more. Convince them they have a problem. For some businesses, you may have come up with a great solution to a problem your customers aren’t even aware of. If this is you, you have to work to show them that they have a problem before you try to convince them to solve it. Compare two solutions. If people know they have a problem and they want to solve it, they may be shopping around to decide on the best solution. If possible, compare your solution to a competitor (or even to the “solution” of doing nothing.) Just make sure yours comes out on top for your ideal customer! Show them a more powerful tool exists. If your business solves a problem in a new or novel way, take the time to show people that a more powerful solution exists. Do a comparison or demonstrate how your process is superior. Is it faster? Cheaper? Easier? More powerful? Gets better results? Share the research. You likely did research before you started your business or in developing your product or service. And there may be other people doing research about your niche right now. Share that research with your audience. Review other products and services. A great way to network and build up links and SEO is to review other products and services that are of interest to your customers. Be sure to let the other businesses know when you’ve given them a favorable review. Show how your solution is different. What sets you apart in your marketplace? Even if you do the same thing as many others — for example, a real estate agent, accountant, hair stylist, or photographer — you bring a unique spin to your business. Showcase it in a blog post. Agitate the problem. If the problem your business solves isn’t particularly urgent, you need to agitate your customers a bit to entice them to purchase. Make the problem feel more immediate. Attract a new audience. Think about a subset audience you might be able to attract to your blog with a post specifically for them. Maybe if you want to reach business owners, you could write a post directly to mom — or dad — business owners. If you want to reach photographers, why not speak directly to pet photographers? Share an industry secret. Every industry has things you just don’t talk about. But why? If there’s really no good reason, why not go for transparency and spill the beans? Your customers will likely trust you more for your candor. Highlight your zone of genius. There’s one part of your business that you’re particularly good at. Write a post that highlights how your business is the expert, the artist, the genius at this particular thing, even if it’s just a subset of what you offer overall. Overcome objections. What are people’s excuses when they decide not to buy from you? Make out a list and then craft a blog post for each one of them that blows that excuse out of the water. Can’t afford it? Write a post that shows why they can’t afford not to invest with you. Create a common enemy. People love to pick sides. It’s human nature! So see if you can create a common enemy that you and your readers/customers can rally against. For an organic food company, for example, it might be GMOs or pesticides. Share a case study. The easiest way to sell someone on anything is to present them a clear before and after. Share a compelling case study any time you want to persuade people to take action and make a sale. Share a favorite tool or resource. People love to feel like an insider, so share your favorite “pro” tools and resources with them. An artist could share tools for hanging pictures. A photographer could share her favorite apps for sharing photos. A jewelry designer could share how she likes to clean, protect, store, or organize her collection. Start a discussion. What are the hot-button topics in your industry? Don’t shy away from them. Even if you don’t want to take a stand, you can open them up for discussion. This helps create a sense of community. Just be sure you have rules in place and standards for making sure things stay civil and respectful. Pimp your products. At some point, you do need to mention what it is you sell! A great way to do this without “selling” is to feature a testimonial, show your product being used in a unique or interesting way, interview a customer, or detail some interesting part of the “behind the scenes” process of creation. It’s OK to remind people you have something for sale. Let them know your why. You may have had a bigger reason for staring your business beyond “make money” — most small business owners do. Share that big why with your readers. Let them see your passions. It helps them get to know you and your business better. Speak to their biggest need or fear. Every product meets a basic human need or solves a basic problem. The more you can tap into these most basic needs, the more likely you will be to convince a person that they need your solution. Write a post that speaks to those most basic needs or fears that your product solves. Write an MVP — a most valuable post. Think about it: What’s the most valuable post you could write for your audience today? Write that. Ask for a referral. It’s a truth universally acknowledged that a large part of any blogger’s audience will be people who already love them and have likely already purchased from them. Tap into that segment of your audience by asking for a referral. It can be as simple as asking them to share one of their favorite products or posts with a friend. Do a link round-up — the right way. Done well, link roundups can be a very effective way to build traffic and good SEO for your business. The key is to let the other websites know that you’ve linked to them, and ask them to share. I have a template for how to write that email inside the Eyes Only Content Library. Quotes or tips from experts. Interviewing other experts in your space — whether you do one per post or many — is a wonderful way to network and get publicity for your blog. Done well, a list of quotes or tips from experts can get shared many times, and assuming you do the right thing and ask the experts to share (see No. 1), you’ll get their audience’s attention as well. If you found this post useful, DON’T keep it to yourself! Please use the buttons below to share it with your network and anyone who might find it useful. Thanks!